The past five years have ushered in a wealth of data in biomedical research. From clinical scheduling to high throughput sequencing, new technologies are generating voluminous data around the clock. Effective utilization of these data has begun a new paradigm, termed Big Data Science. Big Data Science describes the research and application of data integration, analytics, and timely visualization for large-scale data. Big Data Science requires large scale computational infrastructure, database and so ware systems for analysis of diverse data, and knowledgeable presentation to subject matter experts from multidisciplinary fields. The goal of this initiative was to produce Big Data Science for basic, translational, and clinical research at UNC. 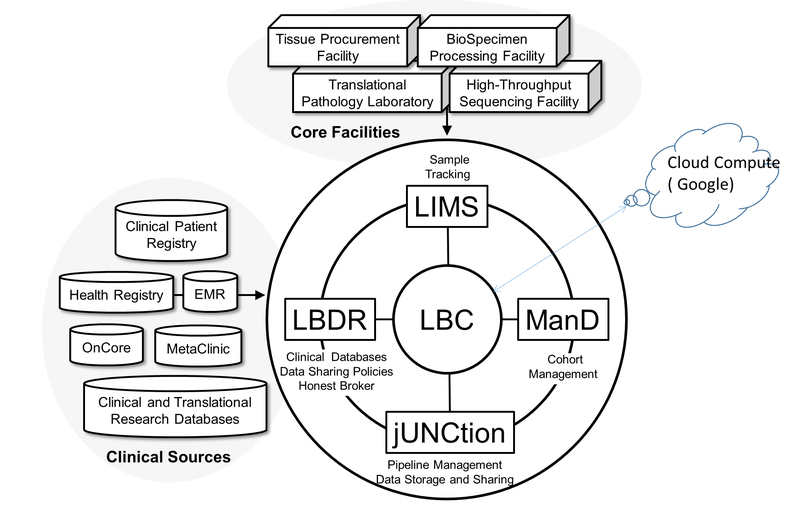 LINEBERGER BIOINFORMATIC CORE (LBC) expertise in Data Science began with the genomics program, particularly gene expression microarray analysis. By necessity, the personnel, computational infrastructure, and broad faculty expertise were built through internal and external recruitment. Over time, Big Data science was required as core services expanded to develop and administer multiple clinical databases and laboratory information management systems. At the same time, the explosion of genomics in cancer research spurred integration of these laboratory and clinical systems to facilitate high impact translational research. The UCRF has provided a foundation to expand the systems, infrastructure, and project support Big Data Science requires to carry out high impact cancer research and improved clinical care.